Disclosure: I am a Schleich Blogger Ambassador. This post is part of a sponsored campaign. I received compensation for my participation, but my review and opinions are my own. I am so happy my husband and I decided to move away from the city and to a rural town in Eastern CT. Besides all the wonderful things available to families in the area, I have to say my favorite part of living in CT is where we live. We are situated among rolling fields and behind our house through the woods is a horse farm. When the girls were little, my husband and I would scroll them up to see the horses. And, as they got older, they moved on to traveling up the hill to see the horses in a wagon, then by feet and now they sometimes venture on their bikes. This has become a weekly ritual for us to visit with the horses and bring them apples and carrots. And, on days that is too hot or about to rain, we will hop in the car and drive up there, just to say "hello." As soon as we stop near the fence and roll down the car window, you can hear the girls calling from the backseat, "Hi Shelby" and Shelby will walk from her stall over to the fence to greet the girls. It is so sweet. 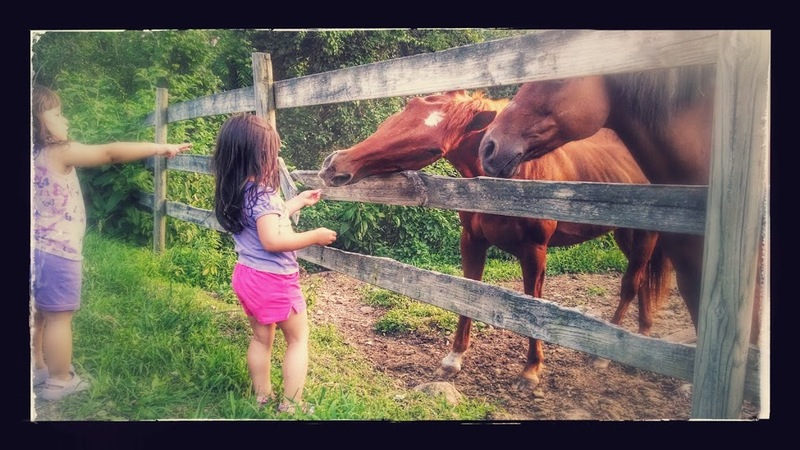 Here is a picture I took last year of the girls visiting with their horse friends, that has become my background for my phone and computer. 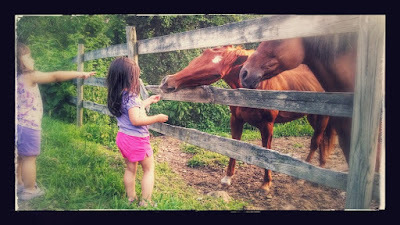 The girls were smiling and so happy, and this is the case each and every time they visit with the horses. They are hoping that when they get a little bigger that they will be able to take riding lessons up the hill and finally get to ride Shelby or one of the other beautiful horses that live on the farm. But, in the meantime they are content with making the trek up the hill to bring treats, or playing at home together or with friends with their new Horse Club products we were recently sent from the folks at Schleich. 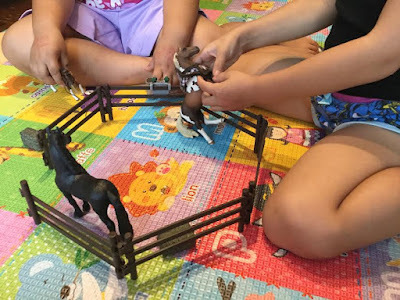 "Schleich is one of Germany’s largest toy manufacturers, providing 80 years of hand painted, highly detailed, playworlds and figurines to stimulate children’s minds and encourage imaginative play." 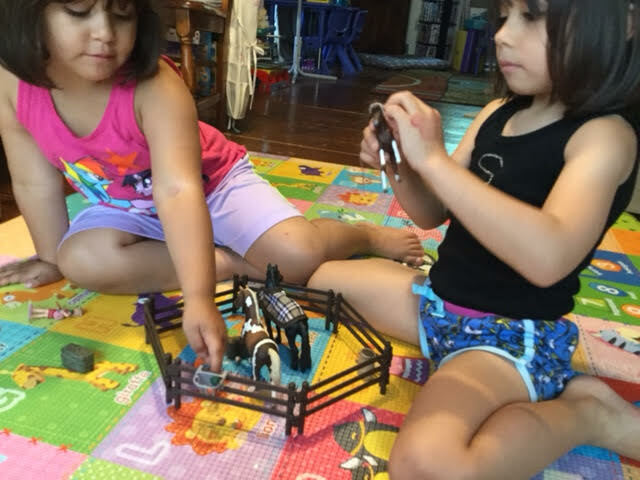 Here is a cute unveiling video I took of the girls. 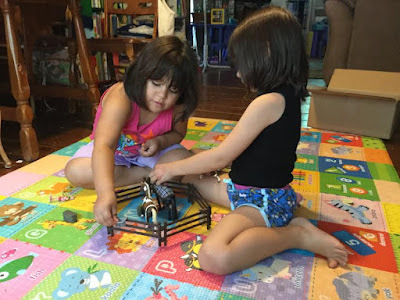 I didn't tell them what was in the box, as I wanted to get their full reaction of taking out the goodies in the box. Horse feeding playset – "The Trakehner foal loves fresh carrots and whenever his friend comes to see him in his stable with a tasty treat, he’s so happy and excited that he paws the ground with his hooves! $24.99, Ages 5-12." Horse care set, Frisian - "Our Friese loves it when he gets a few of his favorite treats before riding. Frisians are almost all completely black.Friesian horses need especially attentive care because of their long mane. Whenever it is really cold outside, you can give it its thermal blanket. Then it feels especially good and does not get ill. $12.99, Ages 5-12"
After I took this video, the girls tore into the packages and started to line up the toys. 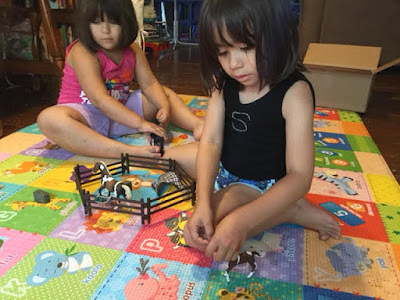 And, for the next few hours they were like two peas in a pod, crawling all over the floor playing with their new Horse Club toys from Schleich. 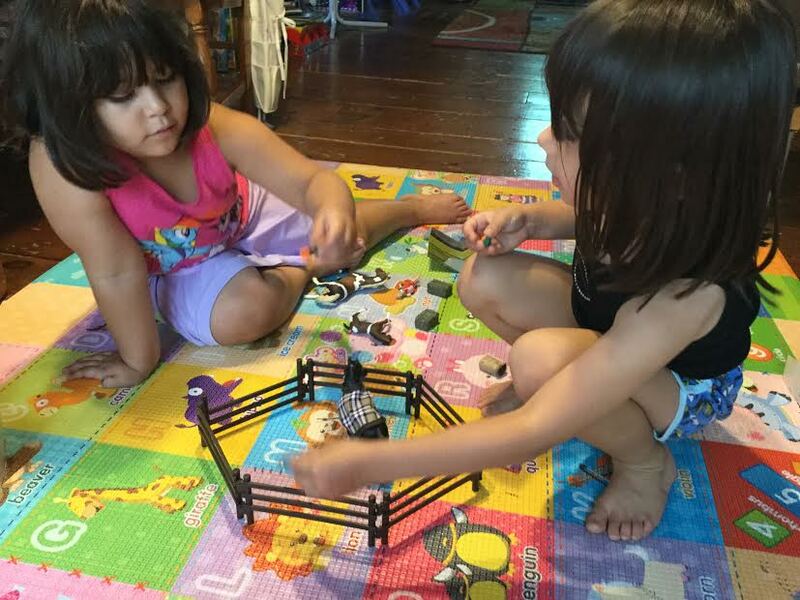 What I loved most, besides the girls playing together without fighting is how these toys got their imaginations going. 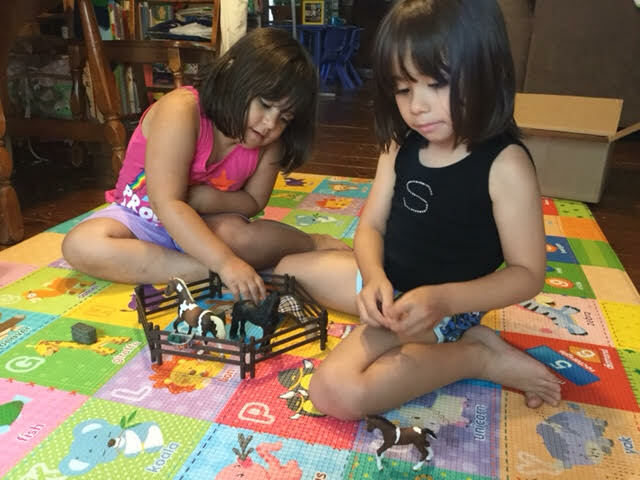 They pretended that one of the horses was injured and needed to see the vet. Another time they were introducing one of the horses to the other as if it was new to the stable. I could go on and on about the stories I heard the girls making up and playing out with their toys. 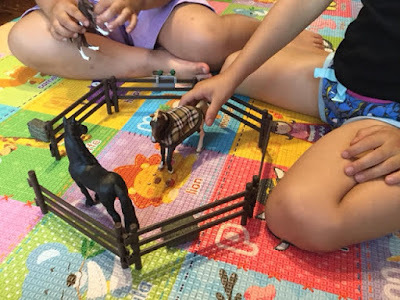 But, instead, here are some photos I took of the girls having fun and really getting them excited about horses, while stimulating their imaginations. 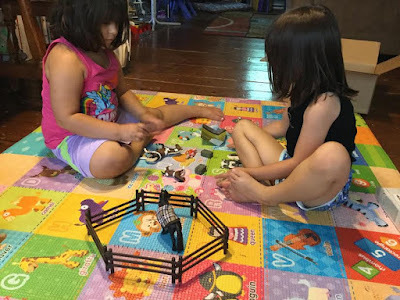 I don't know about you, but when it comes to toys, my girls are excited one minute about a new must have toy, but shortly after playing with it, it finds it way to a corner or toy chest, never to be played with again, unless they stumble upon it. But, unlike these rarely played with toys, the new Horse Club sets and toys from Schleich have become a staple in the girls' day to day play. 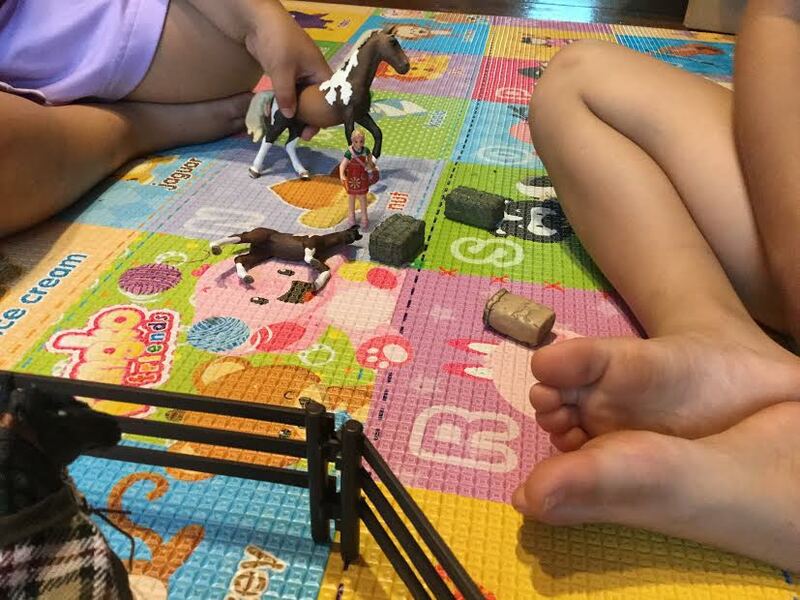 Bella was quick to bring the Horse feeding playset to her room, while Savannah has the Horse care set, Frisian on her little table next to her bed, so she can keep an eye on it, and reach for it as soon as she wakes in the morning. Since receiving these toys and playset from Schleich, the dining table has become a welcoming area for the horses in the AM when the girls sit for breakfast. 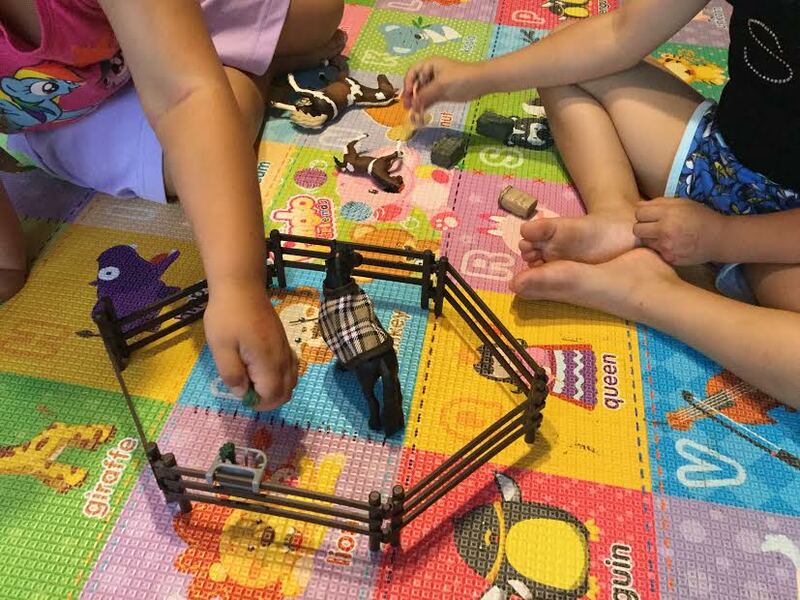 Then, throughout the day they will tote around their horses, or pull out all their horse stuff and play on the floor together. And, when we have to run errands, the girls are quick to grab their horse friends to bring along for the ride. Just last night, I found Savannah reading to her pony, as she practiced one of her new early reader books. She talked to the pony and shared her favorite parts of the book, and then proceeded to talk about the things the two of them would be doing the next day....prepping for a horse jumping competition, of which she and Bella made costumes for the horses out of fabric and even crafted up cute medals for the horses (everyone won), and even made drawings of the jumps and scenery. 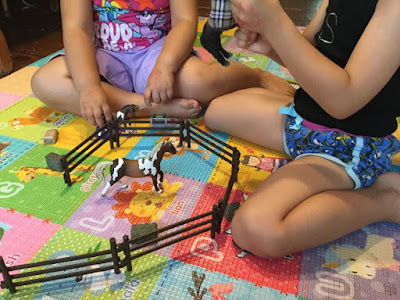 I have to say the girls are really loving these Horse Club toys from Schleich and it really is getting them to use their imaginations in a way I didn't see with their other toys. ...you will not break the bank in purchasing one of more pieces for your child. 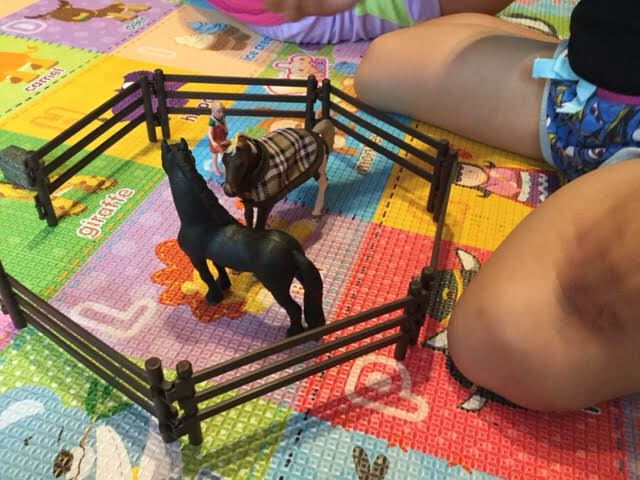 The folks at Schleich have added 18 new products including figurines, playsets and accessories to its Horse Club collection (Available: now and Fall 2016), which are geared towards children ages 5-12 years old. Prices range from $3.29-99.99. I would have loved to have had this as a child. I really love the truck and horse trailer I haven't seen anything like that before too cute.